Categories: Music, Prayers, Sri Swamiji's Kirtans. In this series, we will go on a pradakshina of Bharata desha as we present, each month, a kirtan composed by His Holiness Maharanyam Sri Sri Muralidhara Swamiji on a particular kshetra, starting from south India and then going north. The next kshetra that we will cover in this Madhura Geetham series is located in the heart of Chennai city. Triplicane or Tiruvallikeni is one of the oldest neighborhoods in Chennai, and lies near the seashore. 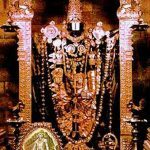 It is so old that in fact, it has been mentioned by Tirumangai Azhwar in one of his pasurams (divine hymns). He refers to the place as a dense forest. Although, the modern day Triplicane is in no way close to this description, the neighborhood is still an important pilgrim spot for the devotees of Lord Krishna. 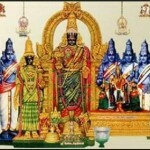 Here, the Lord has manifested in the form of Parthasarathy, the charioteer of Partha(Arjuna). Hence, the Lord has a moustache and holds only the conch in his hand. He is also known as Venkata Krishnan. 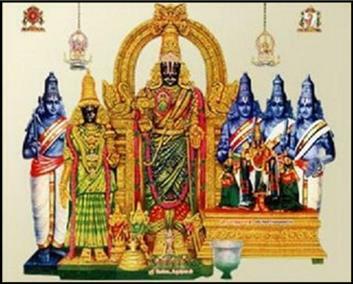 Triplicane was also referred to as ‘Brindavana of South’ because the area was full of Tulsi (Brinda) plants. This temple is one of the favorites of Sri Swamiji. In fact, in the recent past, this temple was renovated and Mahasamprokshanam was performed with Sri Swamiji’s blessings. Below is a beautiful composition of Sri Swamiji on the Perumal here, in Thodi Raga. He is devoted Muralidhara’s favorite Lord!